Car Wrecker Canterbury (Christchurch) NZ - Auto Dismantler Call Us Now! All these avenues have completely different benefits and demerits. If you are looking for someone who can buy your car without giving you too much trouble, the options might get cut short by a few options. Car buyers who professionally buy cars, and car wreckers who buy cars to wreck them and use their auto parts, are the best options that you can look at, honestly. This is because the number of benefits that these high cash giving deals come with, is difficult to challenge by any private buyers, or even relatives. Read on to answer a few questions that we assume you might be curious about! 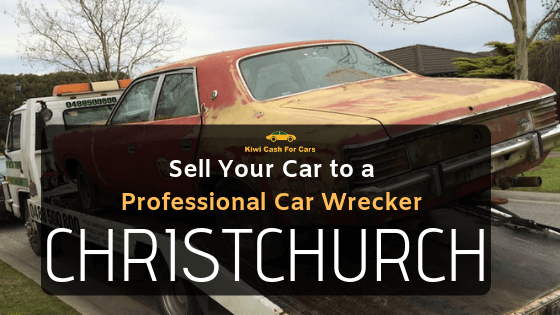 Do you want to sell your car to a car wrecker in Christchurch? It’s honestly the easiest thing you can do! The next question that pops up in the reader’s mind is, “But how?!”. Your answer is, Kiwi Cash for Cars! Kiwi Cash for Cars is one of the best car removal services that pays top cash for scrap cars. It’s not just a car wrecker in Canterbury, but the best one! We buy cars, trucks and all other types of vehicles, irrespective of the condition it is in! Kiwi Cash for Cars is the No.1 Car Removal service in Christchurch. We have our advantages of being able to sell most of your car, by recycling it. We are automotive dismantlers and sell auto parts that are still functional, before wrecking the cars and other vehicles. This is great because we get enough cost for the vehicles to be able to give you a high cash amount for your old car. Ensuring the best possible use of such old vehicles is what makes our expert team the most important part of our business. When you call us for your old car, our team members will offer you top dollar for your unwanted car or unwanted vehicle, whether it’s dead or alive. As auto dismantlers, we ensure that we buy your car and offer you the price that will give you the full value of the car, not just the market price. We are car buyers in the Canterbury region and have access to all the suburbs in and around the region. As we also double-up as a car removal service, and we make sure we can serve our customers throughout the day. We are open all days of the week, between 7am to 5pm in South Island. But if you want to contact us on different hours, you can fill up our inquiry form and we will get in touch with you as soon as we can. Get a Free Car Removal within 24 Hours! Yes, our team will ensure we get to you before the end of the day and get your car out of your way as soon as we can. There’s absolutely no reason to wait more! Give us a call on 021 837 591 or fill up an online form for enquiry.